The vineyard was planted in 1993, and we currently have 4000 vines which include Cabernet Sauvignon, Merlot, and Sauvignon Blanc. 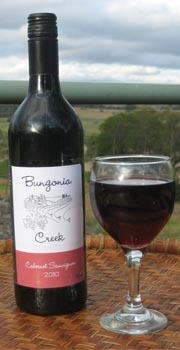 Our vines grow in the rich red granite soils that are typical of this area, and the irrigation for our vineyard comes directly from Bungonia Creek, so we like to think we are turning water into wine! All of our grapes are hand-picked, so our 4000 vines keep us very busy pruning in winter, spraying and thinning in summer and picking at harvest time. We open our cellar door on the property on Sundays from 11am - 4pm, but at other time tastings can be arranged by appointment. Please phone to confirm (02) 4844 4247. There are a number of other small wineries and grape growers in the district, and you can find them through the Merino Country Vignerons Association. Our cellar door is located at 1367 Jerrara Road, Bungonia, which is about 13km off the Hume Highway ( a 10 minute drive) or about 23 km (a 20 minute drive) east of Goulburn.